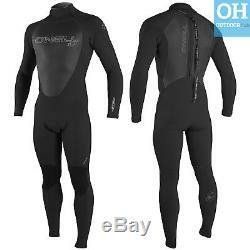 O'Neill 5/4mm Mens Epic Winter Wetsuit Blindstitch 5mm Full Length Steamer Surf. The Epic suit has been an ONeill favourite for years both in the summer and the winter ranges. 2015/16 Autumn/Winter Colourway - Black/Myers/Sky. The perfect winter wetsuit for someone who doesnt want to blow the budget but wants to get out a little more in the colder months. The Epic suit is made from 100% ultrastretch throughout making it even more flexible, whilst also increasing its thermal capabilities. Stylish, classic and clean ONeill graphics and sharp style lines make the Epic one of the best value in the industry today. Glued and blindstitched throughout and fittied with ONeills unique firewall technology makes this truly a warm winter wetsuit. Great looking 2015/16 Autumn Winter colourway - Black/Myers/Sky. Glued & Blindstitch Seam construction. Glued in covert zipper construction with Back-out zipper. External key pocket with loop. The Epic Series has many of the same great features as O'Neill's high-end wetsuits, including 100% Ultraflex neoprene, double seal neck closure, LSD (lumbar seamless design) and re-engineered covert blackout zip. Clean graphics and sharp style lines make the Epic one of the best value in the industry. Image for reference only, bundles and options can vary. Options will not show if currently out of stock. Dispatch is normally the same day, if ordered before 2pm. Please check the dispatch time on the listing for more information. If no cost is shown, the relevant services are not available for the product. These times are estimated and items can take longer to arrive. If your item is faulty/wrong item/damaged, send us a message and we will let you know what the next steps are. The item "O'Neill 5/4mm Mens Epic Winter Wetsuit Blindstitch 5mm Full Length Steamer Surf" is in sale since Tuesday, November 21, 2017. This item is in the category "Sporting Goods\Surfing\Wetsuits". The seller is "the-hubs" and is located in Truro. This item can be shipped worldwide.